Story : In an alcohol free-state, a cruel and clever liquor baron monopolizes the industry until it is eventually thwarted by a police officer. Angered by his loss of wealth, the man retaliates by creating a network of supporters in favor of this black market, gradually establishing himself as Gujarat's most ruthless crime lord at the height of the 1980s Gujarat riots. Gear up for a throwback to the great Salim-Javed blockbusters of the Seventies, where the hero grows up mid-action, every second line is meant to show off the character’s swagger, a Helen song (Sunny Leone here) breaks the tension and action sequences compel you to whistle. Carrying that legacy forward, is Raees. Shah Rukh Khan plays the titular character of a spectacled goon who hates being called “battery”; he starts from harmless Ponzi schemes but graduates to pre-planned rackets and becomes the top bootlegger of his town. When ACP Majmudar (Nawazuddin Siddiqui) is posted in his area, he meets his equal. 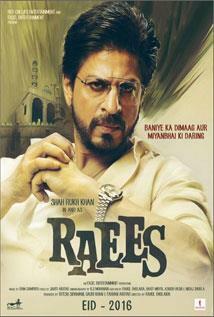 Raees forms a nexus with politicians who fuel his business, but he soon becomes the thorn in their side.